Something is happening. The seasons are changing. It's difficult to keep my feet on the ground. I'm telling you. I'm flying off the earth. It started last Sunday at Koneheta Park in Cherokee County at our 17th annual picnic. There have been a lot of good Netwest picnics over the years. I've missed only one. The Cherokee County members out-did themselves. They welcomed writers as far away as Jackson and Haywood. There were also writers from Clay,Cherokee and some from Georgia. The food was the best ever. I didn't see one Ingles cake on the table. 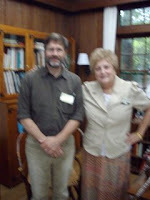 Playwright, Gary Carden was the featured writer. He was born to entertain. He paid homage to Appalachian poet, Jim Wayne Miller who exhorted in his poem: "Come home to your father's house." There were at the same time, near us, some boys practicing baseball with their coach. The boys could not keep their minds on the game. Every time Gary Carden raised his voice, shouting, "Come home to your father's house," a boy would miss hitting the ball or would miss the catch. The louder Gary Carden read Jim Wayne Miller's famous words, the more the boys missed the ball and the louder and the meaner their coach yelled insulting words at them. Sitting between Gary Carden, who was telling his heart out and between the boys who wanted to drop the ball and come over to see who was talking, drawn to poetry I believe, and sitting there in hearing distance of their mean-mouthed coach, who needed someone to gag him, I almost lost my way for a moment. What a presentation from our special guest! The readings continued with old favorites such as poets Brenda Kay Ledford and Mary Ricketson reading their newest poems. You must know, my ears also love to hear those new and younger voices and there were some of those. As it turned out, it was the best NCWN West annual picnic ever. Monday, Tuesday, Wednesday, I tried to get my feet back on Terra Firma. 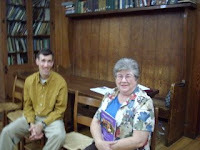 On Thursday evening I went to John C. Campbell Folk School to our scheduled monthly reading. 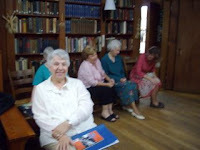 Each month two of our members read there to a captive audience. By that I mean, they read to the folk school students who have come from all over America to learn a craft. In the audience we also have local writers and Netwest members who come to support the program. The featured writers were two of Netwest's most accomplished: fiction writer Jo Carolyn Beebe from Hiawassee, Georgia and poet, Michael Beadle from Canton, N.C. Oops. I started losing traction, floating. What a show! I enjoyed Jo Carolyn's stories. They were filled with vivid imagery. As she read, I felt as if I were turning the pages of a book with colorful illustrations. Michael Beadle is a performance poet. He started reciting loudly, pacing, looking at me. I lost myself. What a joy to remember that there are different kinds of poetry. He recited free verse and read haiku to the beat of a drum. It was inspiring. His best was a free verse poem about a boy wanting his estranged parents to kiss again, so he creates a kiss by taking his father's coffee mug and without washing it, pours his mother a drink. Where their lips touched the mug, he had their kiss. It's the kind of lyric poem I long to hear. On Friday, (just yesterday) all I wanted to do all day was write. I wondered if my life could get better. I reheard poems and phrases in my head. I floated on joy. But the week wasn't over yet. Netwest had scheduled the award winning play, Birdell, by Gary Carden. Gary had donated the play to Netwest for a fundraiser. It was to be performed in Murphy. I went out into my garden to gather flowers to be used as props, got dressed and went to help set up for the play. I knew I would enjoy this play written my our own Gary Carden. But, I was not prepared for this moving story, set in Appalachia long ago. I was not prepared for the professional, outstanding performance of Bobbie Curtis, who took me back to that time in the mountains. She made me laugh and she made me cry, the emotions that remind me I am human. Oops. Yes, after a full week of taking in the word, the word itself, I am still floating. My thanks to all of you who are responsible for my elevated condition. Don't worry about me. Don't call my doctor. I'm fine. I'm alive, healthy and happy.